This is my lastest salami used on free range pork using beef intestines. It is made using the same method as before. However, this time I have put in in the fridge at 9C and 60-80% humidity with door shut. Then the temp and humdity has been very constant at the start. Now at 17 days they still seem a little damp on outside so I removed the bowl of water to allow skins to start to dry off. I am asssuming that after 17 days we are starting to get cured! I think it has helped having temp more even and has stopped any case hardening. At 22 days still wet in there so I have opened the door a crack. So at 4 weeks old with fridge off and open a crack for 1 week in the process to let some moisture come out they seem to be getting there. I have tested a smaller one and it is fine but I am going to leave that one for a week longer. Also the really long ones over a foot long are still quite soft towards the centre so they will need longer. However, if I slice a bit and rehang they will be ok. Also the temp has been between 10-15C and RH 60-75% approx. Now found a tiny bit of green mold growing a few days later so I have wiped over with vinegar and dried off and then hung for a couple of days inside. They have gone all shiny and a bit harder as some fat ozzed out and melted. Now in the fridge for a week till back of holiday. Then back out for 24 hours to dry off again as they got a bit damp again and vac pack. Total time = 5.5 weeks or 38 days. Each Salami is about 170g so I have about 18 little ones. In some cases the longer ones got cut in half before packing. Now in the fridge and some in the freezer! Total Costs = £31 / 3000 = £0.01 per gram or £1.7 per salami if the salami is 170g at cost price! 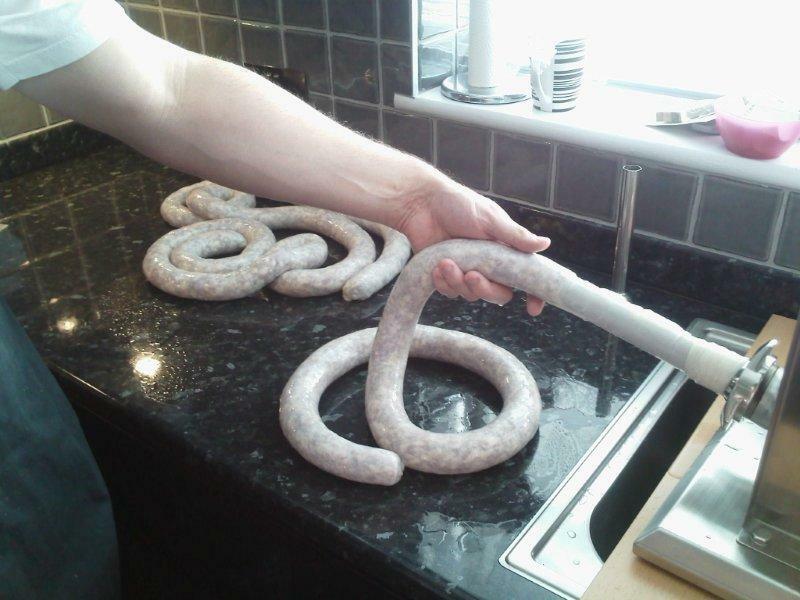 Hence each Salami….. add a bit on for equipment and string etc..! Once bitten, tw...Stephen Powell ...12 WavesSecret of Bolt'...Vector boson fu...Welcome!